You may have seen the adidas Terrex Solo approach shoe in recent years, but never like this. 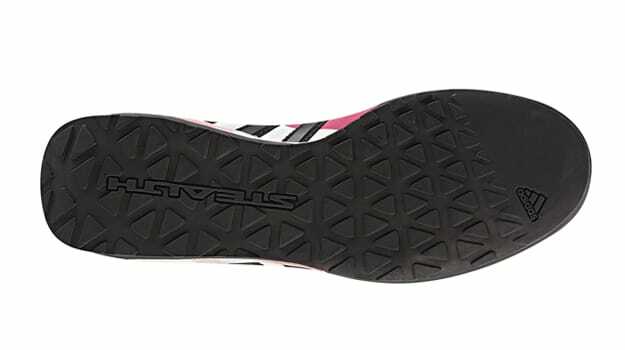 In Fall 2013, adidas is set to introduce an updated version of the lightweight shoe, including a top-of-the-line Steath Rubber outsole. With insight from its sister brand Five Ten, the Terrex Solo Stealth is the first adidas shoe with the heavy duty compound rubber sole. For those of you wondering what an approach shoe is, it’s the footwear climbers and alpinists use to go from their vehicles to the primary ascend point—it’s not quite as technical as actual climbing shoes, but offers a better lightweight option than traditional footwear. Along with the Stealth outsole, the Terrex Solo comes with an upgraded EVA foam midsole, which has been reinforced with a TPU film. In the heel of the shoe you’ll find Adiprene foam for impact absorption and comfort on long approaches. The shoe also features strategically placed loops on the heel so it can be attached to the rest of your gear with a carabiner. The price point for the Terrex Solo Stealth is at $120. We’ll have an exact release date for the shoe shortly.